In the wake of the sexual revolution and the rise of the women’s movement, the 1973 tennis match between women’s world champion Billie Jean King (Emma Stone) and ex-men’s champ (and serial hustler) Bobby Riggs (Steve Carell) was billed as the Battle Of The Sexes. It became one of the most watched televised sports events of all time, reaching 90 million viewers around the world. As their professional rivalry kicked into high gear, off-court the two tennis players were fighting more personal and complex battles. The fiercely private King was not only championing for equality, but also struggling to come to terms with her own sexuality, as her friendship with Marilyn Barnett (Andrea Riseborough) developed. Meanwhile, Riggs wrestled with his gambling demons - often at the expense of his family and wife Priscilla (Elisabeth Shue). Battle Of The Sexes is an entertaining account of a game changing tennis match. Regardless of whether you are a tennis fan or know the eventual outcome, this is a cinematic journey worth taking with themes as relevant today as they were in 1973. Emma Stone gives a powerful, often moving performance in this film. She conveys King’s passion for tennis, her steadfast belief in women’s rights and, in poignant scenes with Andrea Riseborough’s Marilyn Barnett, the challenges that King faced as a result of her sexuality. Meanwhile, Steve Carell proves his range once again - making us laugh and also giving us real insight into the man behind the larger than life character of Bobby Riggs. Carell is utterly (and uncannily) convincing in a performance that is far more than just false teeth and prosthetics. 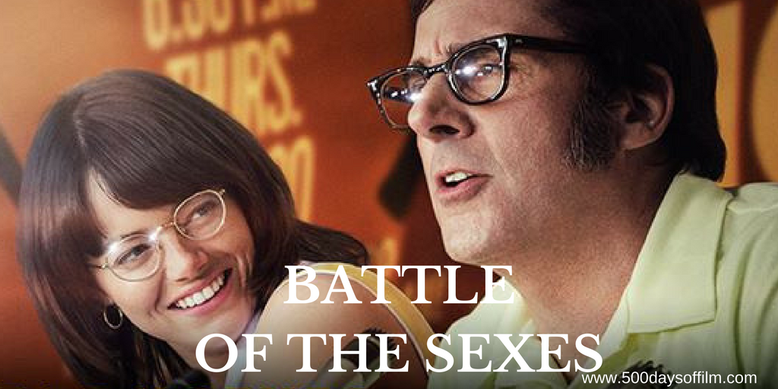 Battle Of The Sexes explores issues of equality, repression, acceptance and denial. This is a heavy load to carry. Despite its two hour running time, the film occasionally struggles with focus as it tries to honour all of the complex characters involved. What works best in Battle Of The Sexes has very little to do with tennis (there isn’t much actual tennis in the movie). Jonathan Dayton and Valerie Faris’s film (shot in authentic 35mm by Linus Sandgren) reminds us how far we have come in the fight for equal rights. For example, the media commentary depicted in the movie contains really startling views that would never be allowed today. In addition, the days have gone (please tell me these days have gone) when a female commentator can be belittled in the way Rosie Casals (a great performance from Natalie Morales) was while trying to commentate on the match. Boy those scenes are uncomfortable to watch. However, the real battle in the Battle Of The Sexes was never really with Riggs or the television commentators. The true fight then, as it is now, lies with the people behind the scenes. Those with the power to make or repress change - represented here by Bill Pullman’s odious Jack Kramer. While, Battle Of The Sexes celebrates the achievements made by inspirational people like Billie Jean King, it also serves a warning. This is an ongoing battle that, if we are not very careful, could still be lost. Battle Of The Sexes isn’t the only film to have explored the impact of this important tennis match. James Erskine and Zara Hayes focused on this event in their 2013 documentary, The Battle Of The Sexes. Great spot on review as always. Really enjoyed this film but there was something that I couldn't put my finger on that prevented from making it a top drawer feature. Emma Stone was excellent as always and how about Steve Carrell? What a superb actor! My own review for this film is available at http://showmethemoviesblog.blogspot.ie/2017/12/review-battle-of-sexes-hard-to-find.html if you wish to take a look.